We had a play date a couple of weeks ago with new friends. I sent my parents on a friend dating mission while they were here and they aced it. We now have one new set a of friends, a California couple with an adorable daughter that L likes to pretend is her little sister. This works out well for all of us, especially given that we don’t have any plans for #2. Despite mixed reviews we thought we would give the zoo a shot, but it was rainy and on the day we planned to go it poured. And poured. Given that neither of us moms relished the thought of being cooped up all afternoon with overly energetic toddlers we decided on an alternative: The Planetarium (Planetário da Gávea). It is a small museum, but engaging with a number of interactive displays. But the most entertaining element was the three story ramp that the girls spent the afternoon running up and down. They have films for children and adults on weekends and holidays and a small library. They even host sleep overs for kids age 7-11. The cafe isn’t anything special but if you are looking for a way to buy some more time in the rain, it works. 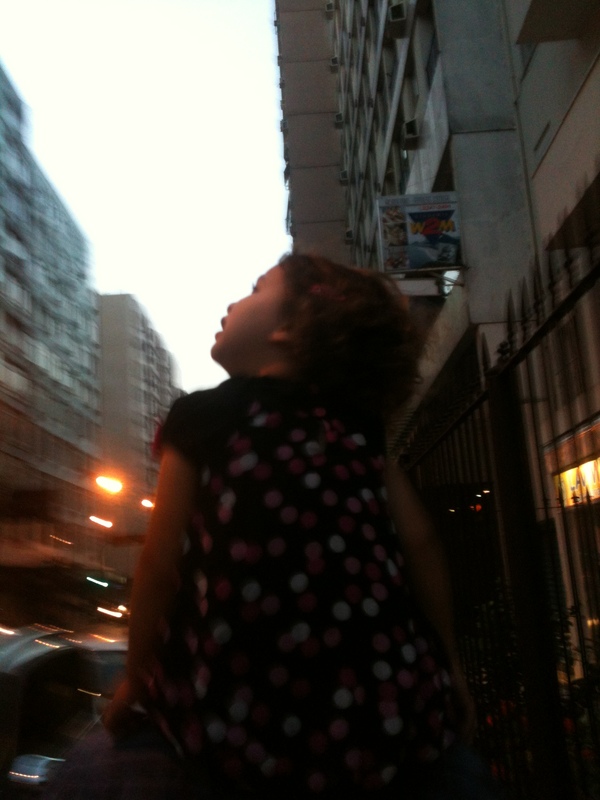 On Saturday, the world here was still cloudy and much to S’s disappointment, L did not want to go out. We spent the morning hanging out around the house. After we ate lunch, we all decided that a bike ride and ice cream sounded good. As we biked around the Lagoa I decided we should take a short detour to Parque da Catacumba (Catacomb Park). Nestled between Copacabana and Humaitá right on the Lagoa, Parque da Catacumba climbs up Morro do Sacopã to a lookout. We parked our bikes at the base of the park and started up the main trail. Lagoa Adventures occupies the base of the park and offers a zip-line and canopying tours. They even have a mini zip-line for smaller children, which was on tour but back should be now in October. The park also serves as a sculpture garden, so we started out looking at “awt” (art). Shortly up the hill, the paved path gives way to Catacomb trail. The dirt path extends up the mountain through the forest and provides a nice escape from the city. Hiking with a toddler, we only made it a short distance up the trail, but it still provided ample ant, bug, and spider–one very BIG spider–watching opportunities. L already decided she is going to take grandma and grandpa exploring when they come, and given it is practically in our back yard, I can imagine she will more than once. Next time we will see if she is brave (and tall) enough to do the mini zip-line. There is something to be said for having a neighborhood hangout, somewhere you can go and they give you a friendly look and don’t really even need to take your order. I have been on the lookout for one here since we arrived. Immediately, I was intrigued by a bustling little corner restaurant, O Caranguejo (The Crab), a few blocks from the house near the metro. It isn’t a very fancy place, but isn’t as dirty as some of the other little corner establishments near us. We could call it rustic. The demographic isn’t quite ours either, but it seems to have regulars and I took that as a good sign. I looked into reviews. A few years back it won a prize for its shrimp empanadas, but more recent reviews were mediocre rather than glowing. Guide books said its prices were reasonable, but in passing by with our friends that were visiting a few weeks ago I took one glance and thought they were way too high. What I didn’t realize at that time was that one plate, or rather a half a plate, easily feeds two to four people. Friday was a long day. L and I spent a good part of our afternoon hanging out a McDonald’s play area in the burbs waiting for our car to be fixed. We got home late and both S and I were in need of a date night. Given that it was cool out and late, we didn’t want to venture far since we had to be back in time for L’s bedtime so we decided to give O Caranguejo a go. We got there around 6:30 and outside seating was taken so we sat inside. We ordered a bottle of wine, the shrimp empanadas and the HALF seafood paella. The empanadas were small and okay. We have had better. L prefers her empanandas deconstructed (or rather she picks out the shrimp). The paella did not quite fit what I consider a traditional paella but I lived with an amazing Spanish roommate in Egypt who could cook a killer paella, so perhaps I am a harsh judge. Had this been called a seafood shrimp casserole or some other name, it would have been great. But really, I am not about to complain about semantics here. What really rocked the night was that S and I actually got a pretty kid-less date. Only in Brazil would this happen and it all be okay. Early when we got there, S took L to the bathroom. On the way out our waiter caught them and told Lara to come with him. The restaurant is very small and the indoor area only has about ten tables. The waiter guided L over to a table a few tables from us and pulled out the chair, introducing her to an older couple. He looked at us, winked, and told us that the woman is crazy about kids. Before we knew it, L was drawing and making napkin balls, and talking their ears off, and S and I were drinking wine and discussing adultish kind of stuff. Fifteen minutes into our dinner, S winked at me and told me that he even could get them to feed L. I knew they were an easy target and within seconds they waiter was taking L’s plate to the other table. A couple bites later, L sent her plate back and came to sit with us, but as soon as her dinner was finished she was off to play with her new friends. As we paid the bill, S nonchalantly asked the waiter if the couple comes often. He laughed and said every day. The couple turned around and said they can’t wait to see L again am pretty sure that S and I both decided at that moment that our search for a neighborhood hangout had come to an end, especially if sitters are provided! We survived our first Brazilian birthday. We met all of L’s classmates. They understood my Portuguese. It was everything she wanted: blue, cupcakes that she got to decorate, chocolate covered almonds, coconut brigadeiro (with real chocolate sprinkles that might have taken a tumble in route to the party), and pão de queijo. L was so excited she didn’t even eat her cupcake, but she talked a lot about it. I did learn that apparently few kids here drink “leito puro” (pure milk). I thought their teacher was referring to them drinking powdered milk. Nope. None of the kids, other than L, wanted to touch the milk since it wasn’t mixed with chocolate. Now to prep for our next visitor. Let the planning begin! So I am kind of on a roll. Last week, precisely when I lost L’s Tinker Bell birthday invitations that I never replaced since we are doing it at school anyway, we got one in the mail–the one I was worried about setting a precedent before we had L’s simple party at the school. Well, I swore the party was tonight and while I thought that a Sunday night party from 5:00 – 9:00 p.m. was a bit ridiculous, I assumed it because it was (1) a holiday weekend, and (2) because this is how Brazilians do it. This will teach me to make assumptions. We spent all weekend prepping L for the party, going shopping for a present for her classmate, wrapping it up, having L write a card, and tonight she chose a special party outfit. While S and I weren’t thrilled about going out on Sunday night and loading our kid up with sugar, we were excited to actually meet some of the other parents. When we got to the building and rang the bell, we realized immediately that something was amiss. The doorman didn’t seem to recognize that there was a birthday party in the building. I pulled out the invitation to confirm we were in the right place and that is when I saw it–the date. 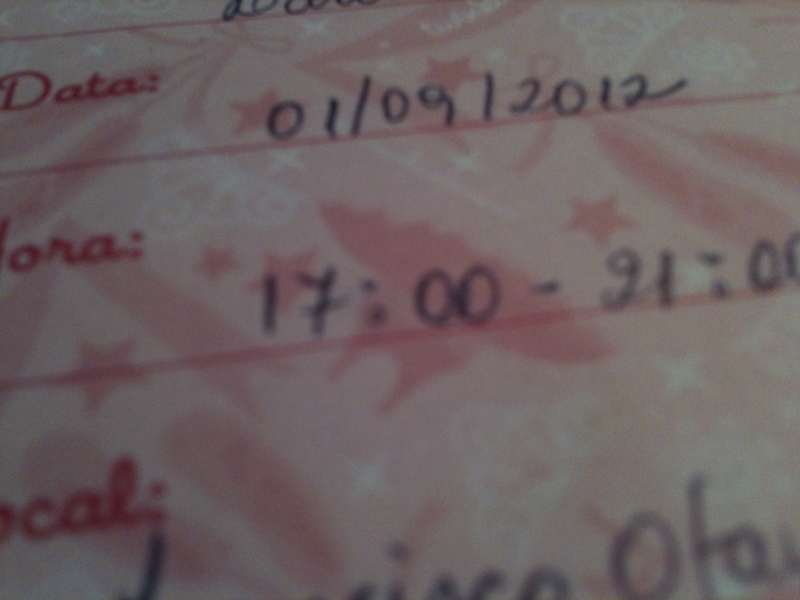 The date actually said 01/09/2012, meaning last Saturday. In my defense, old habits die hard. I only found the invitation in L’s backpack on Tuesday, thus I assumed that the party was this upcoming weekend and when I glanced at the date, I intuitively looked at the middle 09 since we Americans usually list the date month/day/year (we don’t have to get into the fact that I date all my computer documents according to international standards). Anyway, there we were, all three dressed to make an impression with nowhere to go and having to break it to the little one that there would be no party, friends, games, cake, or candy. I tried to explain that I made a mistake and confused the date. Ten minutes later L told me, “I made a mistake too. I wanted to go to M’s party.” Not sure the whole message got through, but she did understand that there was not going to be a party. We settled for pizza, building a tent, and frosting L’s cupcakes when we got home. Brazilian kid birthdays are a big deal. Tons of food, elaborate themes, party houses, trampolines, ball pits, games, candy, lollipops, sweets, and beer to help get the parents through. If you don’t believe me just look here, here, or here. L’s third birthday is on Monday and this whole birthday extravaganza hasn’t ever really been our thing. Not that L hasn’t had great birthdays. On her first birthday we went to a nearby park, I made an awesome layered lemon cake and totally bombed L’s monkey cake (so much so our friend told me it looked like burnt lungs). On her second birthday, we had a wonderful BBQ at the park where we ate good food with our friends and the kids ran around and wore themselves out. Both low key. Given that neither L or us have many friends here and that it is a holiday weekend, I originally planned to just have a family birthday party for her. I figured we will have plenty of birthdays to come where her inflated expectations will lead us to do ridiculous things (though I am not sure we are talking Brazilian ridiculousness). But I did decide to ask L’s school if she could bring treats and the director suggested we just hold the birthday party there. Perfect. Simple, short, and I won’t have to clean up. But as the director mentioned what we could do, I realized that even the simple expectations were above and beyond what I had envisioned. I guess cupcakes on napkins wasn’t what they had in mind. It is at this point that I realized the conflict of expectations I have going through my mind. In Chicago, I would have worried about sending too much sugar in the treats, especially since it is at noon the part-time kids won’t have eaten lunch yet. Here, I am suddenly worried about not having enough stuff. – Goodie Bags: A cup filled with homemade play dough, mini bubbles, a whistle, a lollipop, and a mini bag of jelly beans. I couldn’t bring myself to fill other people’s houses with tons of cheap plastic toys that I wouldn’t want in mine. I am counting on the school for songs and games. In and out in a half hour! I have to say I was, up until last week, comforted by the fact that L had no point of reference of what Brazilian birthday parties were actually like. Then on Tuesday we received an Angelina Ballerina invitation to L’s classmate’s birthday party on Sunday night from 5 – 9 p.m. So much for that. But I guess there is no better time to learn that some parents are just lamer than others, and L was blessed with those, at least when it comes to birthday parties.